I took inspiration from my guild's square and rectangle scrap challenge to design this quilt. I began with a tiny thumbnail sketch and cut all of my green scraps into the largest squares I could. Then I used my design wall to plan the layout of my first slab and filled in around my squares. After the first slab I imposed some additional rules on myself to create similar, but not identical, slabs. This 61.5" x 66.5" quilt made a big dent in my green scraps and used up the majority of my neutral scraps. I'm submitting it for the Just the Top category of the Pantone Quilt Challenge hosted by Bryan House Quilts and No Hats in the house. You can see a bit more of my process in my original post. I'll begin teaching this technique in workshops this Fall. I'm linking up to the Just the Tops Pantone Quilt Challenge 2017 Linky Party. Posted in Quilting. 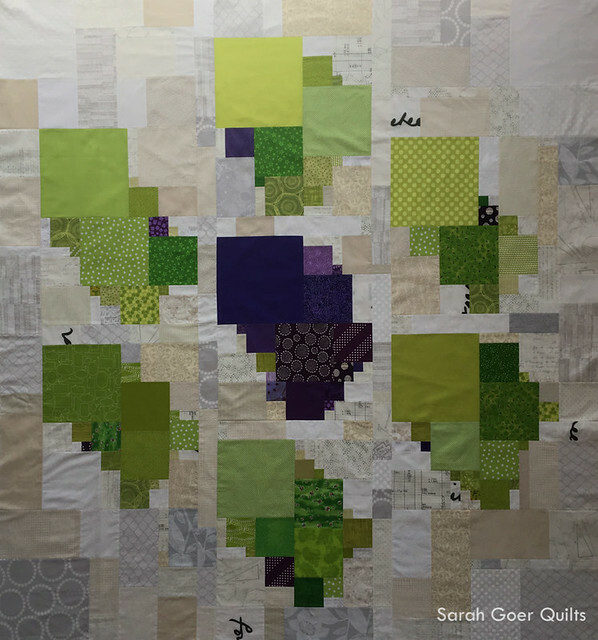 Tags: challenge quilt, Greenery, planned improv on May 29, 2017 by sarah. This grew into a beautiful quilt. I don't think I have enough neutrals in my stash to do something this large. Nice Sarah! Good luck in the challenge! That's a neat technique. I like your quilt top! Thank you, Elizabeth. I really enjoyed the process. After the first slab I was addicted. This came out great! I do love that pop of contrast, but especially the bits of black text in the LV. Oh, I hesitated to use those bits, but I'm glad I did. Thanks, Sarah! Beautiful! I lave the dark purple with all of those greens.